Bruce is a shareholder at Barrow & Grimm. He practices in the areas of business formation, corporate and business organizations, business transactions, employment law, general civil litigation and estate planning. Bruce’s clients range from small local start-up companies to established larger companies that conduct business throughout the United States, Australia, South Africa, UAE, Netherlands and the United Kingdom. 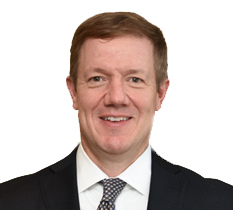 Bruce received his Bachelors of Business Administration in Finance and a minor in Political Science from Texas Christian University and his Juris Doctorate from Washburn University School of Law. He is a member of American Bar Association, Oklahoma Bar Association, Kansas Bar Association, Tulsa County Bar Association, and is a Fellow of the Oklahoma Bar Foundation. He has been a member of the Tulsa County Bar Foundation (TCBF) Charity Golf Tournament Committee benefiting the Disabled American Veterans, Blue Star Mothers, and the TCBF Outreach Program from 2002 to 2012. He served as the Chair of the 2009 event. Bruce is admitted to practice before the United States District Courts for the Northern, Eastern and Western Districts of Oklahoma and the United States District Court of Kansas. He was recognized as a Rising Star in 2008, 2009 and 2010 by Super Lawyers. In addition to participating in a variety of professional organizations, Bruce enjoys volunteering as a coach for youth basketball, football, and baseball. Bruce enjoys working with his clients to assist them in a variety of ways. In 2008 Staff Sergeant Eric Maddox acknowledged that his vision, efforts and commitment were instrumental in getting his book entitled, “Mission: Black List #1 – The Story of Saddam Hussein’s Capture” written and then published by HarperCollins.